I took this photo a while back, but just thought of posting it here now. 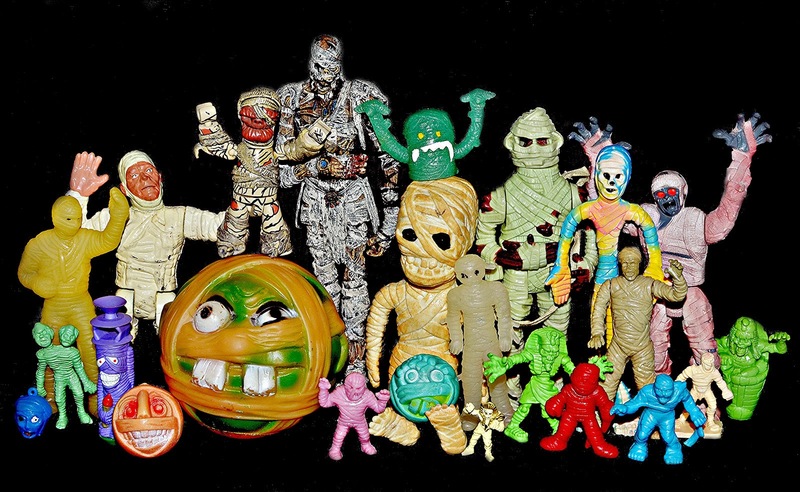 I was going through stuff and noticed how many different mummy toys I had amassed over the years, so thought I'd dig out all of them I could find and get a group shot. Some of these I've had since the '80s and a few I just got in the past couple years. Just for fun, how many different toy lines can you identify from the pic? I also have Dust Brain from the Madballs Head Poppers series, now THAT's a great mummy toy! Nice. Is the "Cinema of Fear" one the little Mummy standing on top of the Madball? I bought it years ago and totally forgot where it came from, haha. I'll have to try to track down one of those Head Poppers one of these days. I don't own any. Just spotted the little Mighty Max mummy down there as well - that's why I prefer laptops to phones, no details are missed, ho ho! I've got all but one of the Head Poppers now, but need to get Screamin' Meemie again - snapped his popper so his head won't stay on now, bah. I also recognized the Sungold Mummy. The card art for that toy line is just hilarious, I wish I had a carded Sungold Monster! I love that little mummy finger puppet! I remember getting that Sungold Mummy at a mall dollar store when I was really little...I wish I would have gotten more of the monsters! The finger puppet is from Russ, probably mid-'90s. What line is the little red mummy from? That was actually made with the Creepy Crawlers oven. I made him back in the '90s as a kid. It was from the set of monster molds they came out with. Can you give me any information on the mummy sitting in the middle? That's a stretchy jiggler-type figure filled with pellets. I remember getting it at Walgreens, probably 8-10 years ago. It was part of a set with other monsters, I believe sold around Halloween. Just right of center in the picture there is a rubber glow-in-the-dark mummy. Any idea what he is from? I have him and have been wondering for years where he came from. He came with a coffin, I'd say late '90s. Wish I could remember the name. If I find out I'll comment again.